The second day of our special 53rd Annual I & WEMRC Exhibition. The first day of our 53rd Annual I & WEMRC Exhibition. 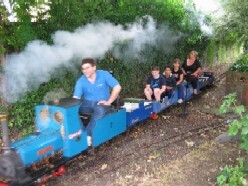 Our final Steam Day of this year, another busy day with many of our regular visitors turning up. Thanks for your support, and see you all again in April 2009! A similar day to the previous month, but a very busy one, with full trains most of the day day. The weather was a bit 'Wimbledon', much like it was this time last year, but that never stops us, nor our regular visitors! 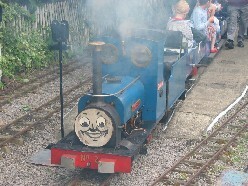 Thomas Junior was in steam again, and managed a short run, if not actually pull a train load. Good weather once again (it's always about the weather, isn't it? ), for our third Steam Day of 2008. 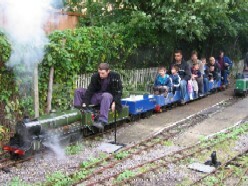 This was the busiest Steam Day we can remember having, with full trains all day long. of the children, and just about managed one trip - not bad for it's first outing in nearly 2 years! Welcoming in Tony Spencer as Honorary Chairman, with thanks to Alan Waredraper for his year in the job. 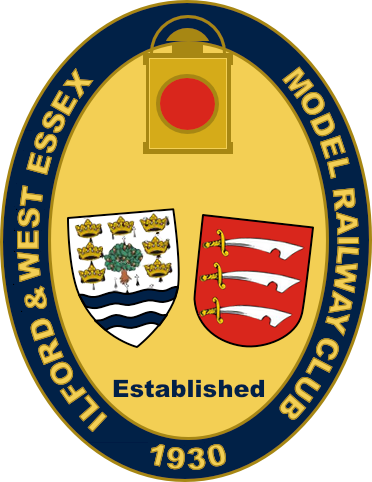 Appointment of Frank Roberts as Chairman Elect. 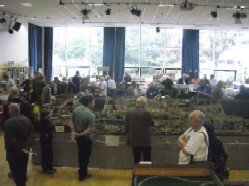 Ken Mayor takes over from Peter Edmondson as head of the N Gauge section. 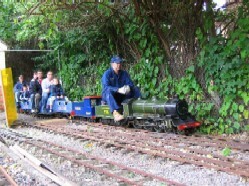 Terry Horner takes over from Tony Spencer as head of the O Gauge section. All other section heads and committee officials are happy to continue in their current roles. This year the Hugh Gwyther Trophy (named after a long-standing late member of the I & WEMRC) goes jointly to Steve & Ian Waredraper for their various efforts toward the Exhibition, Steam Days and club house. Bit of a contrast in temperature to the April Steam Day. One or two minor problems with Excalibur in the morning, but otherwise business as usual! Despite the extreme weather we went ahead and steamed up on Sunday 06 April - it takes more than a little bit of snow to stop the railway enthusiast! In case you were wondering, yes, it was cold!